It's that time of year again...time for great savings for Black Friday and Cyber Monday! 3Gstore is celebrating by offering some amazing deals, including special introductory pricing on hot new items like the Taoglas 8" Indoor/Portable 3G/4G Antenna ($39.13 - regular price $59.99) and Long Range Invisible Ethernet Bridge ($449.13 - regular price $649.99). Other deals include the Cellphone-Mate CM288W Full-Band Omni Antenna for just $49.13, Wilson Sleek 4G-V for $89.13, Single-Outlet IP Switch for $49.13, and MANY MORE! We're also offering daily giveaways throughout the sale! Prizes include the Peplink Balance 20, Wilson Sleek 4G-V, Cellphone-Mate CM700V-32, Pepwave Surf SOHO, and a grand prize of a 64GB Apple iPad Air! No purchase necessary - click here for full details and instructions to enter. Customers shopping during the sale will also get FREE SHIPPING on all orders over $99 (contiguous 48 states only). 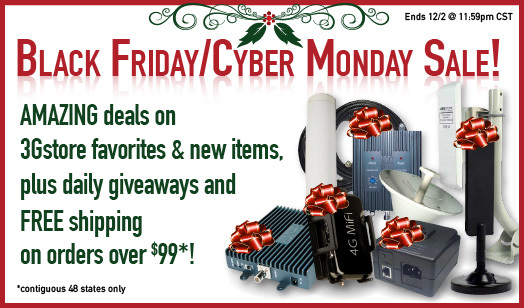 Don't miss out on these great deals: the sale ends at 11:59pm CST on Monday, 12/2!